The COMM Combustor Model 2 is an effective emissions control device that has been designed to meet both federal and state requirements. What is used to insulate our combustors? Our combustor insulation is comprised of dual layered Kaowool Blankets. Why do we insulate them? The combustor insulation serves many purposes. One of which is to protect the steel walls of the combustor stack from the heat while also protecting the hot combustion flames from the relatively “cold” steel walls. The insulation helps to maintain a warm combustor stack for increased combustion efficiency. How much assist gas is required for a battery of 4 tanks with 1400-1600 BTU gas? Our combustor are natural draft systems that do not require assist gas for this type application. COMM has an air inlet flame arrestor that keeps flames from propagating out of the air inlet around the base of the stack. There is also the option to install a deflagration arrestor on the gas line going to the burner that prevents flames from travel backwards through the piping and reaching the tanks and other process equipment. What is the average volume of accumulation in the liquid knockout of a combustor? How frequently do we need to suggest operators check and empty them? Most operators see very little liquid accumulation. They usually start off checking daily and then depending on how much they are seeing, they may switch to checking on a weekly basis. All depends on the gas compositions, line installations, and ambient conditions. Some operators slope their combustor/flare lines back to the tanks/berm area and have an external knockout drum with a pump to automatically dump liquids back into the tanks. With these setups, the knockout pot in the base of the combustor hardly sees any liquids and is used as a secondary liquid knockout. How exactly does the alarm system on our combustors work in regards to the pilot light relighting process? Requires the solenoid option. The panel opens and closes a solenoid that controls the flow of fuel gas to the pilot. When starting up, the pilot begins sparking and the solenoid opens to allow fuel gas to the pilot. The pilot will light, the panel sees this, and stops sparking when pilot flame is present. While running, the solenoid stays open and allows fuel gas to the pilot for a constant burning pilot flame. If the pilot flame were to go out due to a momentary loss of fuel gas, the panel will see this and keep the solenoid open and start sparking the pilot to try and relight. After 3 failed attempts to relight, the panel will go into a flame fail (pilot fail) mode and close the solenoid to the pilot. Panel will issue an alarm signal and will have to be reset by the operator to try and relight the pilot again. 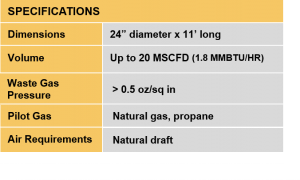 What size combustor do I need based on Mcfd and Btu? What rate are our candlestick flares rated to? The candlestick flares come in a large variety of sizes up to 5 MMscfd (5,000,000 scfd) and beyond. What type of burner do we use in our combustors? Does our pilot stay lit or do we have a sensor that activates and lights when gas is released into the combustor (ignitor switch?)? Our pilot stays lit. It is self-monitoring and in the case the pilot would go out, the pilot would automatically start sparking to try and relight. After 3 failed attempts to relight, the panel will stop sparking and generate a pilot fail alarm. How do our combustors handle intermittent gas flow? What gases can our combustors destroy? Hydrocarbons and the associated gases that come from oil/gas production, gathering, and storage. Is there a BTU minimum or maximum for proper destruction in our combustors? Federal regulation states a minimum BTU of 200 BTU/scf. What pressure rating can both inlets on the Model 4 handle? They are not pressure rated. KO pot is good for up to 15 psig.